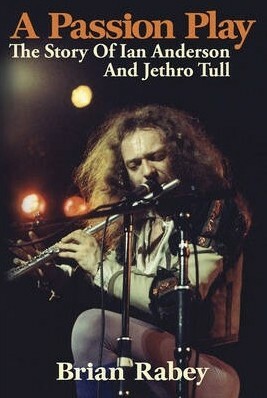 Brian Rabey has produced a definitive biography of Jethro Tull with an unsurprising emphasis on Ian Anderson, the focal point, writer and founding member. To that point, the book comprises two parts, firstly a detailed chronological biography of the band and secondly a series of interviews with Anderson on notable subjects such as songwriting, instruments and his views on Frank Zappa and Captain Beefheart. The history of the band, which spans a total of 155 out of the 225 pages, is interspersed by details of the studio and live albums with full track listings and associated notes. The book starts with the band's roots including the formation of The Blades and the John Evans band. These stories are brought to life with interviews and notes from the majority of the key members of these early bands which evolved into Jethro Tull. Following the choice of the Tull moniker, the book vividly describes the relatively swift rise of the band into album (and to a lesser extent single) chart residents especially in the US with the canon of 'Aqualung' and 'Thick As A Brick'. It is very easy to forget (or not know) how big Jethro Tull was; as well as the late 60s to early 70s purple patch, Jethro Tull released the Grammy winning and heavy 'Crest Of A Knave' in 1987. However, they almost as quickly moved into more of a cult following from the late 80s onwards. Interviews with Anderson and Martin Barre, the guitarist who is the second most celebrated Tull member, show their philosophical approach to where the band sits in the public eye. The Ian Anderson section clearly demonstrates that he is a thinker, an intellectual and is very introspective. He clearly has much to celebrate; above success, performing is his passion and he still wants to improve as a musician. The book has been carefully written, very much from a fan's perspective but qualified by the interviews / quotes from so many assorted Tull members. It provides a detailed discography but also many glimpses into the reasons why the Jethro Tull sound is unique. Most importantly, it brings to life the music and times of the almost criminally uncelebrated Anderson and his band members.